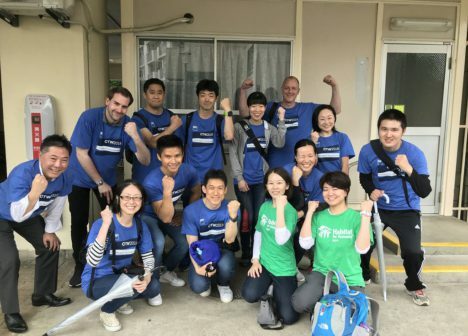 June 6th, Tokyo – On the day when the rainy season started in Tokyo area, 14 volunteers from Goldman Sachs gathered in Shinjuku in spite of the weather. 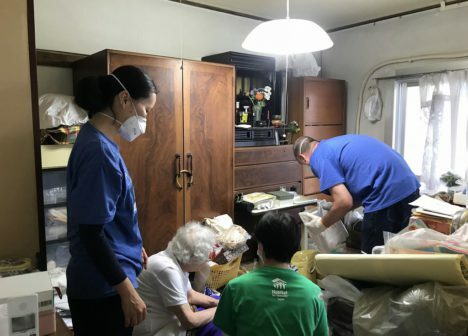 Through Goldman Sachs annual volunteering program called Community TeamWorks, in collaboration with Habitat Japan’s Project HomeWorks for the first time, the volunteer team supported two households and the community as a whole. The day started with Habitat staff introducing the housing support and the issues that lie behind. After the orientation, the team moved to the project site and spread into three groups. One group worked with a lady in her 80s living alone. Volunteers cleaned the ceiling lights that are too high for the lady to reach and the bathroom where she’s not capable of cleaning because of her back pain. They also made the living room tidy where there were many paper bags and other items on the floor that had been collected over the years. The volunteers asked the homepartner about each item whether she was willing to keep it or not. The room became very organized at the end. Another group worked with a man in 40s that has disability. Volunteers thoroughly cleaned the kitchen and the bathroom which had not been cleaned for many years. 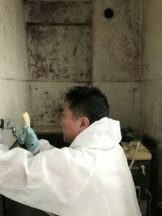 After cleaning, the homepartner’s futon mattress, which have become unsanitary after long usage, was replaced with a new one by the volunteers. In Project HomeWorks, we provide support to people that have various types of difficulties that cause them unable to clean and organize the living space. We support improving of their living environment, and for that volunteers’ help is essential. We not only support individuals in need but also give efforts to empower and revitalize the community as a whole. The third group of the Goldman Sachs volunteer team, in cooperation with the local leaders’ group, helped replacing the lights on the shared hallways. This helped the community of many elderly people to tackle one of their local issues. Thanks to the generous support from Goldman Sachs and enthusiastic and powerful CTW volunteers, we were able to assist two homepartners and the community they live in. Thank you CTW volunteers!! Please join again! !